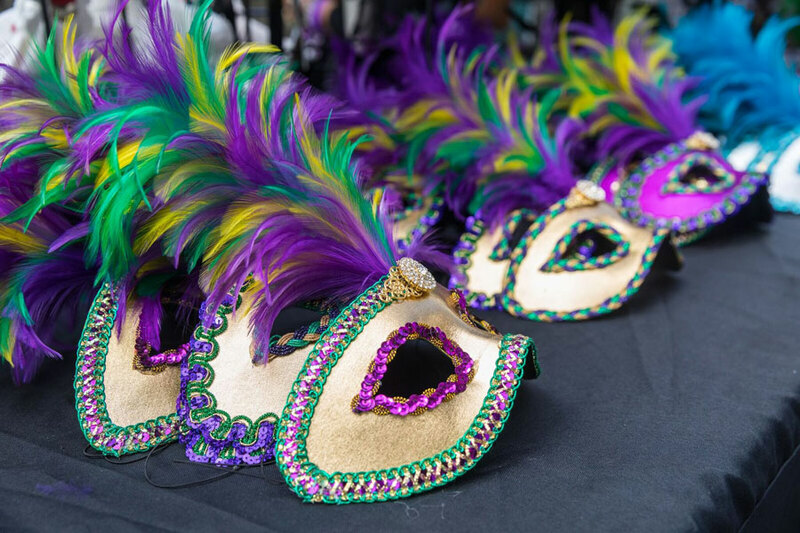 As a native New Orleanian, my favorite tradition to share with family and friends is the annual Mardi Gras Mask Market, a four-day family-friendly festival and a unique specialized craft fair showcasing artisan mask makers. 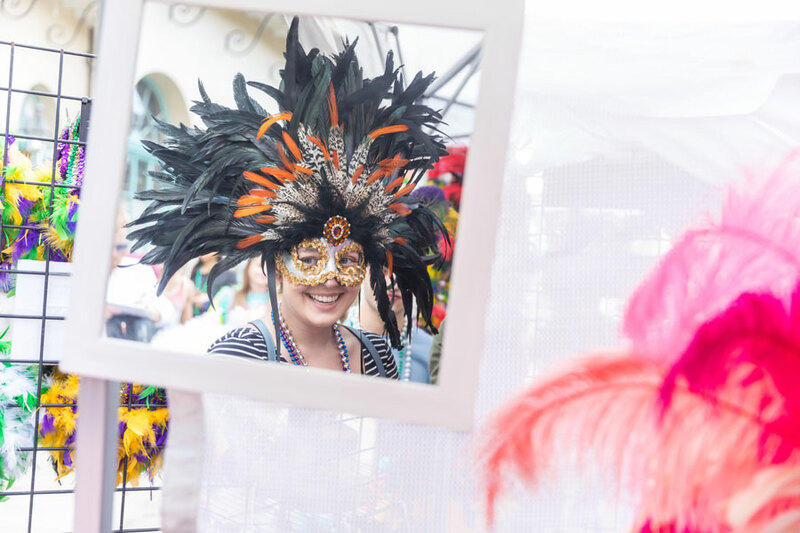 The days, as one may expect, are filled with live local music, usually involving brass bands, local legends, and Mardi Gras Indian groups, food, drink, and Bacchanalian revelry. 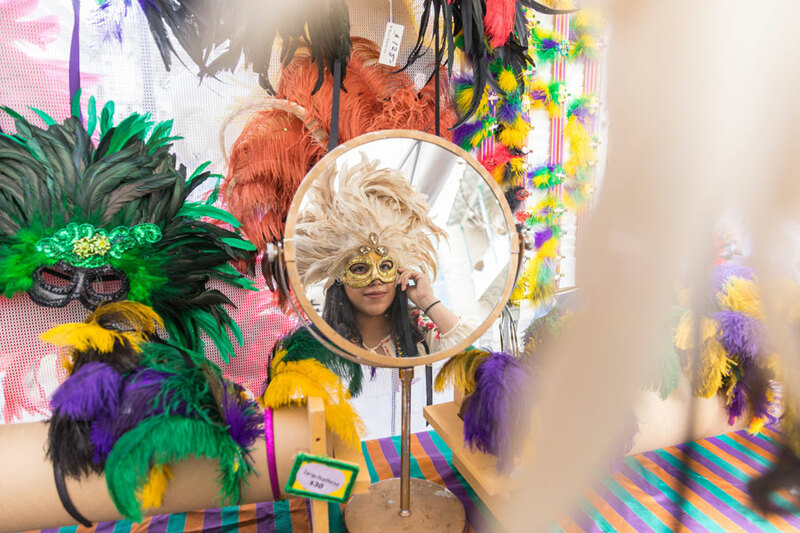 The Mask Market at the French Market will take place in Dutch Alley, at the intersection of Dumaine and Decatur Streets, Friday, March 1st through Lundi Gras Monday, March 4th from 10 am to 4 pm daily. Mask makers from around the country will converge on the French Quarter to show and sell their handmade masks during this unique event. Here, my friends and I always find the perfect accoutrement to set off our costume from the large selection of masks and headpieces created in a variety of mediums including feathers, leather, metal, and cloth, all handmade by master artists. While many masks are simple, there are many artists who creatively put a lot of pride in making elaborate and beautiful masks. My favorite is the old traditional Venetian style masks that go well with my frilly and colorful satin outfit. Believe me, skip the cheap imported mass-produced masks in most of the shops and hold out for a unique custom handmade mask! You will long appreciate the fine artistry in these masks to wear, collect, and display for a lifetime. Mardi Gras veterans know that wearing a mask takes the stress out of a long Fat Tuesday. Mardi Gras and masks are synonymous! Whether they cover your eyes or your whole face, masks add mystery and intrigue and are one of our favorite local traditions. Masks have been worn for centuries during rituals and celebrations and within the performing arts. Mardi Gras masks originated in ritual celebrations, and wearing a mask allows one to escape society and class restraints. Transformation of identity is a central element in Carnival, and disguising our face is the easiest method of transforming or concealing our identity. Mardi Gras krewes have long enjoyed maintaining an element of secrecy as membership in krewes are often kept secret, as is the identity of the kings of these groups. In fact, riders on Mardi Gras floats are required by law to wear masks. A mask certainly helps to maintain secrecy, enabling us to appear in public without revealing who we are. With a mask, we are free to be who we want to be and mingle with everyone. Mardi Gras is the largest masked party in the United States since it is a day when everyone is free to wear masks, adding to the excitement and celebration. Find the mask that fits with your persona and make memories as you enjoy role-playing all day!